Like many mass shooters, the 19-year-old suspected of shooting and killing at least 17 people and injuring 17 others at a high school in Parkland, Florida displayed warning signs prior to the shooting. According to media reports, the alleged shooter was known to have firearms, and his mother had contacted law enforcement regarding his behavior on multiple occasions. 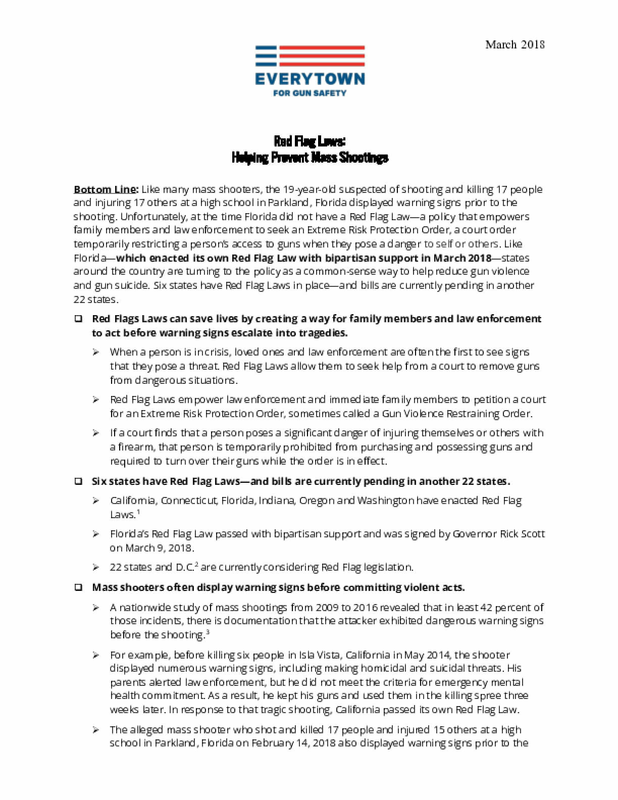 Unfortunately, at the time Florida did not have a Red Flag Law—a policy increasingly being adopted by states that empowers family members and law enforcement to seek an Extreme Risk Protection Order, a court order temporarily restricting a person's access to guns when they pose a danger to self or others. Like Florida—which enacted its own Red Flag Law with bipartisan support in March 2018—states around the country are turning to the policy as a common-sense way to help reduce gun violence and gun suicide. 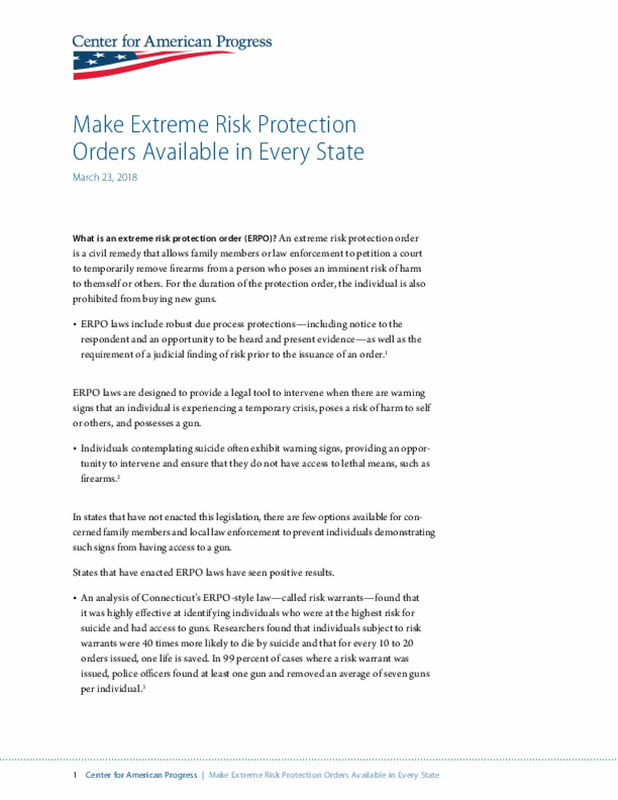 Six states have Red Flag Laws in place—and bills are currently pending in another 22 states. Red Flags Laws can save lives by creating a way for family members and law enforcement to act before warning signs escalate into tragedies. For two decades, as the result of a coordinated attack by the gun lobby, the Centers for Disease Control and Prevention (CDC) has been hamstrung from researching gun violence as a public health crisis. In 1996, congressional allies of the gun lobby added a rider to the CDC budget that prevented the agency from spending any funds to "advocate or promote gun control." 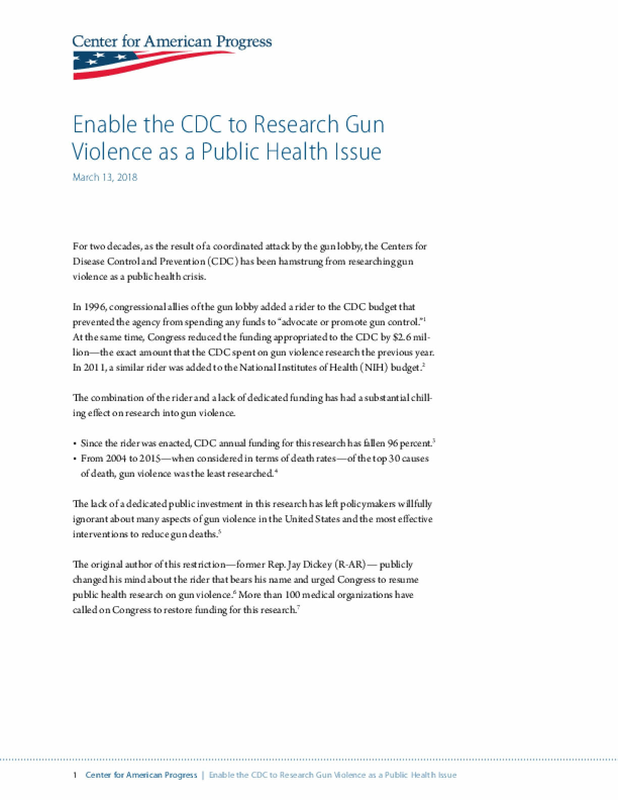 At the same time, Congress reduced the funding appropriated to the CDC by $2.6 mil-lion—the exact amount that the CDC spent on gun violence research the previous year. In 2011, a similar rider was added to the National Institutes of Health (NIH) budget. 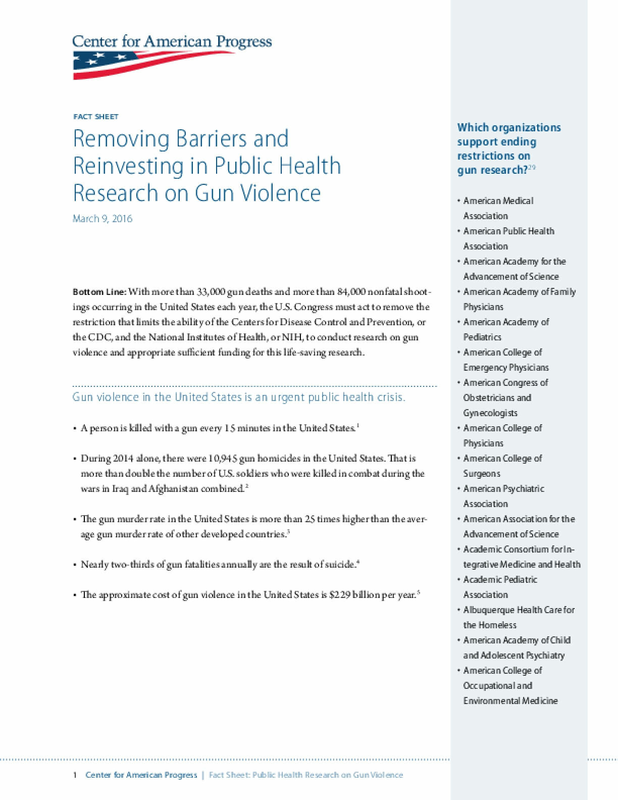 The combination of the rider and a lack of dedicated funding has had a substantial chilling effect on research into gun violence. Schools are meant to be places of sanctuary, safety, and learning for children. But, as the mass shooting at Marjory Stoneman Douglas High School in Parkland, Florida, shows, children are also victims of America's gun violence crisis, even while attending school. After shootings like Parkland, and as a way to further their "guns everywhere" agenda, the NRA takes every opportunity to push for policies that would arm teachers. There is no evidence that arming teachers will protect children in schools. 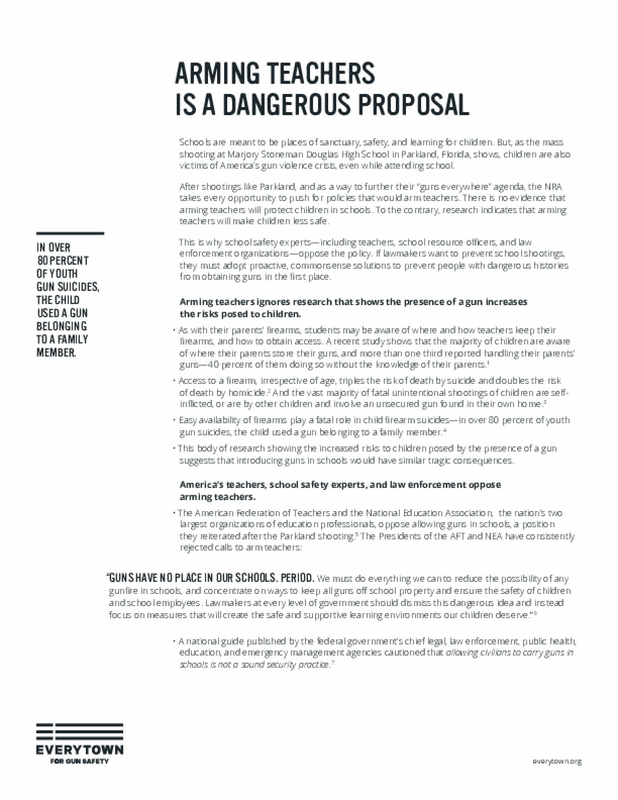 To the contrary, research indicates that arming teachers will make children less safe. This is why school safety experts—including teachers, school resource officers, and law enforcement organizations—oppose the policy. 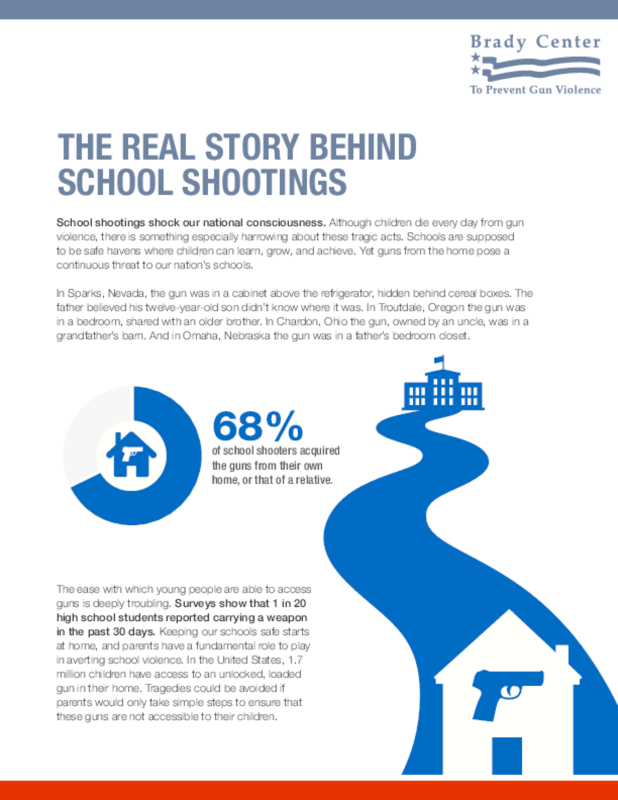 If lawmakers want to prevent school shootings, they must adopt proactive, commonsense solutions to prevent people with dangerous histories from obtaining guns in the first place. 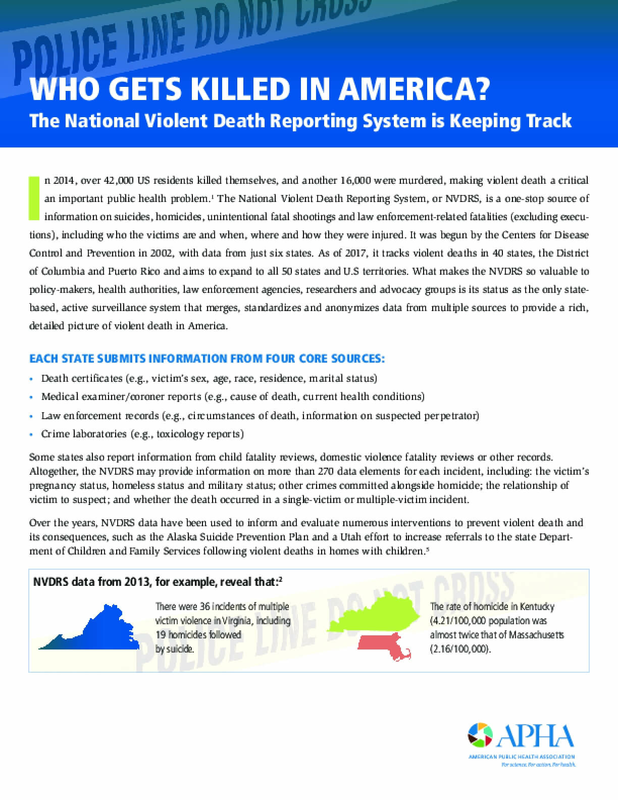 In 2014, over 42,000 US residents killed themselves, and another 16,000 were murdered, making violent death a critical an important public health problem.1 The National Violent Death Reporting System, or NVDRS, is a one-stop source of information on suicides, homicides, unintentional fatal shootings and law enforcement-related fatalities (excluding execu-tions), including who the victims are and when, where and how they were injured. It was begun by the Centers for Disease Control and Prevention in 2002, with data from just six states. As of 2017, it tracks violent deaths in 40 states, the District of Columbia and Puerto Rico and aims to expand to all 50 states and U.S territories. 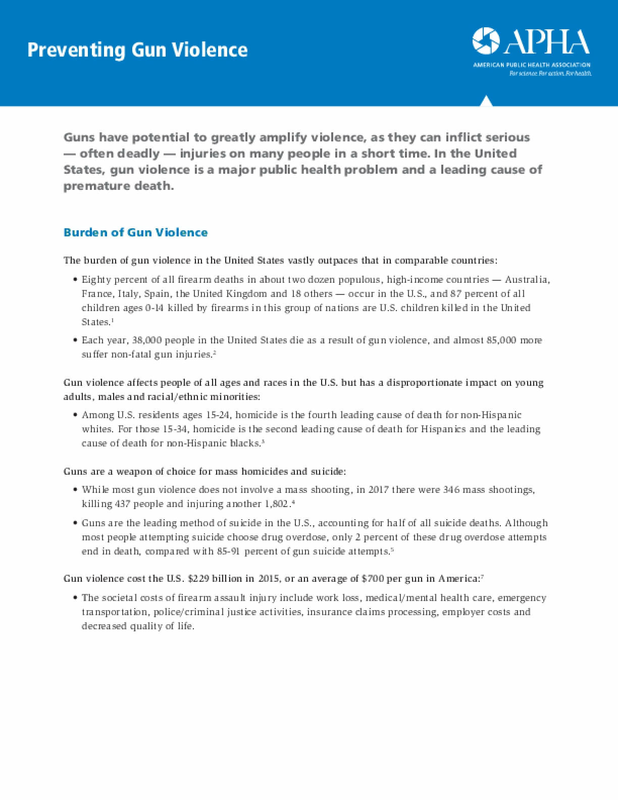 What makes the NVDRS so valuable to policy-makers, health authorities, law enforcement agencies, researchers and advocacy groups is its status as the only state-based, active surveillance system that merges, standardizes and anonymizes data from multiple sources to provide a rich, detailed picture of violent death in America.